In an effort to reduce air pollution, the city of Nuremberg, Germany, partnered with mobile carrier Telefonica and big data company Teralytics to pinpoint carbon emission hot spots and improve its transportation system. Using telecom data to understand how people travel — cars, trains, walking — in a comparison with a network of air-quality measuring stations, it was able to secure funding for further efforts to reduce carbon emissions. Using data from billions of signals from cell towers and other sources, Teralytics and geographic information system software company Esri mapped evacuation from the Houston area just before Hurricane Harvey. He maintains that because “every grandmother carries a cell phone,” telecoms hold the richest real-time dataset on human movement. Even when people are being evacuated, they keep their phones with them, he pointed out. “Cities are getting more dense, new modes of transportation coming in 10 or 20 years. Congestion is getting worse. … We provide the underlying layer — understanding the demands of transport and to optimize it so the environmental impact is minimized,” Franceschina said. Ride-sharing, such as Uber and Lyft, will change transportation demand, as will autonomous cars in the longer term. Cities need to understand and prepare for even longer-term modes of transportation, he said, such as the Hyperloop and Lilium, a company working on electric flying taxis. 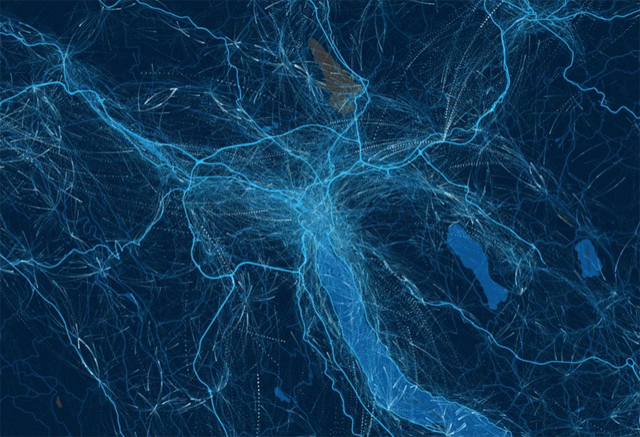 The idea for the business grew out of ETH Zurich university, where the co-founders —Franceschina, Georg Polzer, and Donald Kossmann — worked with a local telecom to analyze commuting patterns for the government. The four-year-old company is building a platform that operates within the secure network of mobile network operators. They basically become a sensor network for human movement. “We get relatively raw data from within the telecom that is anonymized and turn it into predictions or recommendations [for customers]. We have visualizations, real-time dashboards where customers, for example, can see how many people are on a specific train,” Franceschina explained. It reports processing data from more than 400 million people using cell tower pings and incoming WiFi, combined with clickstream data from mobile devices. It reportedly has worked with eight telecoms so far, operating in Zurich, New York, Singapore and Hong Kong, and recently signed a partnership with Hong Kong Three. For analysis, Teralytics uses proprietary machine learning algorithms as well as open source big data technology. The platform is based on Apache Spark and Kafka, running on Mesos, deployed via Ansible and HashiCorp Terraform to bare metal machines and the cloud following infrastructure-as-code principles, Franceschina explained. “We have developed proprietary APIs and processing frameworks to efficiently store and process the mobile network data. Plugged into those APIs are our machine learning-based online and offline algorithms that transform the data into insights for transport operators and smart cities. The algorithms have been optimized to run in parallel on hundreds of terabytes of data,” Franceschina said. For displaying the data on dashboards, the service relies on GraphQL and React, running on Node.js on the cloud, making it accessible by customers in urban planning, transportation operations, or disaster response. Results can also be fed the results into geographical information system software such as ESRI’s ArcGIS. The business model is a revenue share with telecoms. In a recent report, Gartner cited machine learning for location-based products among the ways communications service providers can add to their revenue streams. Even so, privacy concerns abound about telecoms’ use of user data. Earlier this year, U.S. President Donald Trump signed legislation overturning rules that banned Internet providers from collecting, storing, sharing and selling consumer information, including location data. That legislation got heavy assists from U.S. ISPs including Comcast and Verizon, as well as the likes of Facebook and Google, according to Politico. Franceschina said the company is only interested in the movement of crowds and uses only anonymized data. I asked him whether the data could be used to determine whether a married person was having an affair. He didn’t answer that, saying the company only wants to use data for good. Teralytics (not to be confused with Teralytic, an agriculture tech startup) looks to expand into more countries, Franceschina said, as well as devise the ability to detect more modes of transport. It already can determine whether a person in a car is taking a ride-share. Many cities, he said, are interested in differentiating between a person walking and riding a bicycle. The company’s interested in helping organizations optimize bicycle routes in the future.